I have to confess, I knew very little of the aquamarine gem. Having now researched it, I’ve come across some beautiful stones and with summer just around the corner I may just have to ask my favourite jeweller to create a piece for me! Aquamarine is associated with a happy marriage, youthfulness, hope and waves. Sailors have long believed in its protection which isn’t surprising for a gem named after the tranquil blue seas that make us dream of exotic. Generally chosen as a 19th anniversary gift, this stone is the blue, greenish blue to green-blue variety of the beryl. Traces of iron in beryl’s crystal structure cause aquamarine’s color and gem and jewelry lovers prize aquamarine that is medium-dark blue to slightly greenish blue with fairly strong intensity. 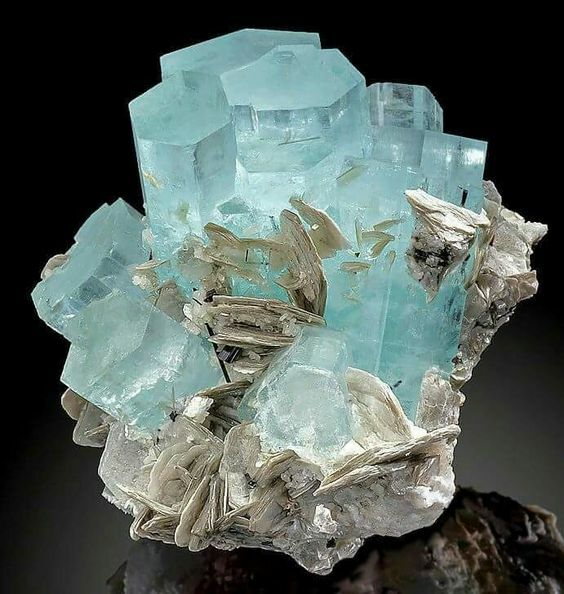 Aquamarine grows in beautiful six-sided prismatic crystals and can range from very small to very large (45 kg). Faceted stones are often exceptionally transparent and are often cut into emerald cut, round or oval brilliants. They usually have no inclusions and they are generally cut in sizes larger than five carats to intensify their colour. They may conjure beautiful images of the sea, but aquamarines are normally mined at altitude. They can be found in the Brazilian state of Minas Gerais, deep in the heart of Pakistan and in several places in Africa. Surprisingly, it is the state gemstone of Colorado where it can be found in the Mount Antero area. While relative abundant, aquamarine is a beautiful affordable gem that will make a great addition to your jewellery collection.